Pixabay Paper birch isn't the only tree with bark worth looking at this winter. Autumn's fiery-colored leaves have fallen, so now let's look for more subtle beauty in trees and shrubs. Like a developing photographic image, the textures and colors of bark come into view in the increasingly stark winter landscape. Paper birch isn't the only tree with bark worth looking at. Take a look at the spectrum of colors in bark. There are reds ranging from the fire-engine red of the shrubby redosier dogwood to the coppery reddish-brown of the Nanking cherry to the dulled red-brown of Cryptomeria. Individual trees of river birch each have their own bark hue, some cinnamon-brown, others reddish-brown or grayish-brown. If you think pale gray is a boring color for bark, look at the bark of a hundred-year-old beech: The trunk and limbs seem alive enough to start moving. The bark of some trees is decoratively dabbled with colors. Sycamore is one of the most familiar of such trees, but lacebark pine and stewartia also are worth planting for their bark alone. The pine's bark is richly mottled in browns and greens. Stewartia has a gray bark daubed with cinnamon and dark olive-green. Let's not be so wowed by these colors that we overlook barks' textures. Fine, papery peelings curl away from the bark of the paperbark maple and the above-mentioned river birch as their trunks expand in girth. Except for an occasional interruption of warty lenticels, the bark of Nanking cherry shines as if it has been buffed daily with a shoe-shine cloth. The reddish-brown of cryptomeria bark is intensified in warmth as it peels away in long, soft shreds. With some trees and shrubs, the barks' textures are a show in themselves. Long, vertical strips of shagbark hickory bark remain attached to the trunks at their middles, their upper and lower ends curling away to create a shaggy trunk from top to bottom. The little blocks of the bark of persimmon and flowering dogwood give the trunks the texture of alligator hide. American hornbeam, a small understory tree common in our Eastern woodlands, has a bluish-gray, close-fitting bark whose smooth surface is broken up by sinewy ripples. It looks like muscles, and “musclewood” is one common name for this tree. The bark of the hackberry has a subtle yet, to me, very beautiful color and texture. It's gray, with corky warts and ridges breaking up a smooth background. When lit by the low, winter sun, these warts and ridges shadow light on the smooth part of the trunk with a clarity that reminds me of photos of craters on the lunar landscape. Trees and shrubs are everywhere, so the beauty of bark can be appreciated on sycamores on a city street as well as on shagbark hickories on a woodland hike. The plants I've mentioned are only a few of many with notable bark. If I've succeeded in convincing you to plant a tree or shrub just for its pretty bark, something you might admire in winter through a window or as you walk outside, then go to an arboretum to see mature specimens. With most plants, it takes some time for bark to develop character. 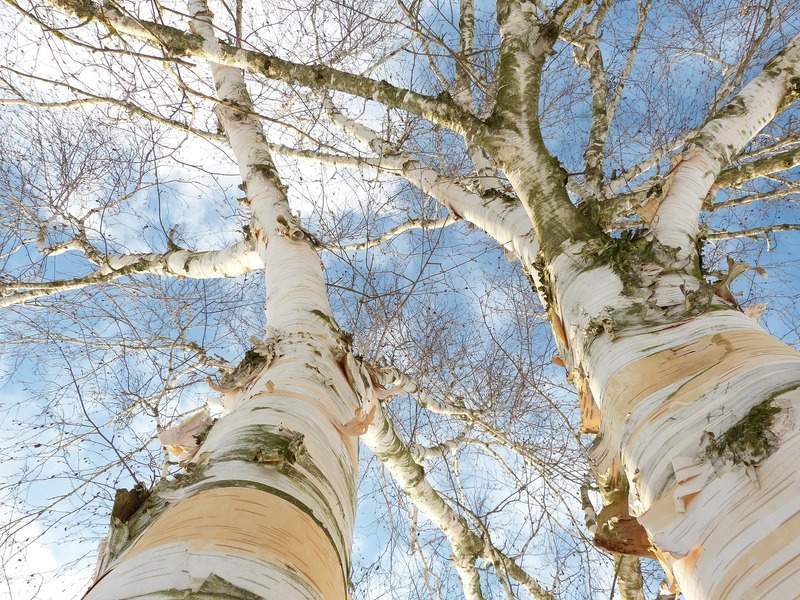 Even paper-birch bark is smooth and reddish brown until age turns it white and peeling. But time is not wasted waiting for a young tree and its bark to mature; while you're waiting, enjoy the way the smooth bark of young twigs glistens in the light of the low-hanging, midwinter sun.